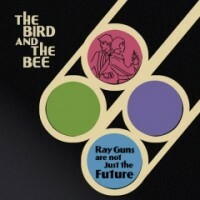 A lot of words could describe Los Angeles duo The Bird and the Bee – jazzy, danceable, retro, catchy, glossy – but more than anything else, the band exudes a constant air of cool through the fourteen tracks of Ray Guns Are Not Just the Future, the group’s second full-length release. Make no mistake though, this is not an avant-garde, forward-thinking kind of cool but rather a fully backwards-looking, head-twisting cocktails, Dean-Martin-on-acid jazz pop as swinging as it is savvy. Noted studio hand (the bird) Greg Kurstin provides the bulk of the foundation for (the bee) Inara George’s breathy tenor with liberal fusion of ambient synth, dance beats and old-timey keyboard to form a sound not entirely new, but certainly not entirely familiar, either. The somewhat inconsistent but thoroughly enjoyable Ray Guns proves, however, that Kurstin and George haven’t quite perfected the formula. Considering the group’s penchant for danceable pop, it should be no surprise the album’s strongest tracks are its uptempo numbers. On the reassuring “Birthday,” George reminds a lover just how intertwined she and he have become; “Diamond Dave” gives a fitting love letter to the once and future Van Halen front man, throwing in just a hint of David Lee Roth’s patented innuendos over a bouncing, descending bassline, upstroked guitars and Old West piano lines (“Come on Dave / Show me what you’ve got / I can take it”). Late in the album, the showtune-y “You’re a Cad” casts George as a scorned woman telling her man off in almost hilarious self-deprecating fashion. Where the group falters is not in any of its sonic endeavors, but rather in some of its stylistic choices: while most of the choices on the uptempo numbers pay off huge dividends, moments such as the love-theme-gone-wrong of “Baby” or the awkward torch song musings of “Witch” fall short of the impossibly high standard set by the album’s opening rave-ups. Their missteps are fairly infrequent, but become very highly magnified in the context of the disc’s scant 45 minutes. Those miscues aside, Ray Guns Are Not Just the Future is ultimately a disc entirely befitting its title. The sound of Ray Guns hints at a time where actual ray guns were imagined to be the future; The Bird and the Bee probably know they are not the future of anything either, but any group capable of tracks on par with the excellence of the glorious “My Love” or aforementioned missive to “Diamond Dave” need not worry about such silly things as tomorrow when today yields such a mighty result.